Here is our third Green school flag for Water. We were awarded this flag on the 23rd of May last year in D.C.U. We walked in and awarded the flag on stage. We also got a certificate. There were speeches and performances from other schools. They were cool and we learned a lot. Some schools have been doing this for 16 years and we would like Scoil Mhuire to as well. ​The committee worked really hard and we want to thank them for all their hard work. We liked doing assemblies and trying to get everyone to save water. We ran a poster competition, we had a water action day and a Save Water quiz. Classes did experiments about water and projects about the arctic and global warming. 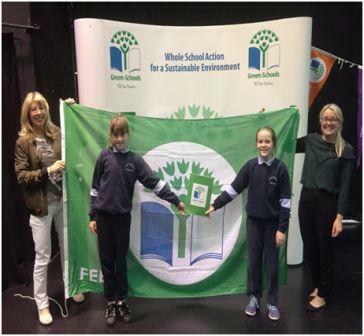 We enjoy doing the Green Schools Projects, we learned loads and we hope that all primary schools in Ireland will get involved. It is a great way to help the environment and raise awareness. We had a splashing time for water week. We had some fun floating and sinking, measuring, making precipitation and lots of other wet things!!! Take a look at our pictures. Two children from each class from 3rd to 6th Class and Ms McPhillips.